Summer arrives on sheer, silent wings that move with a flutter of color and lightness of being. Greeks once believed that a human soul came into the world whenever a butterfly emerged from its chrysalis. In parts of Asia, butterflies symbolize happiness and joy. Once, while traveling as a storyteller in the Highlands of Scotland, I learned the Celtic belief that the Wee Folk, the “Tuatha de Danaan,” can change into a butterfly to avoid being discovered by people. If anyone harms a butterfly, that person hurts one of the Wee Folk, an act that brings bad luck. Back in the 1970s, the Butterfly Effect spun off from the concept of Chaos Theory, which attempted to reconcile the apparent randomness of the universe. The Butterfly Effect holds that the faintest movement of air caused when a butterfly flaps its wings in, say, Massachusetts, begins a series of interconnected events that can ultimately cause a hurricane in some distant place like Cuernavaca. We now seem to be experiencing a reverse butterfly effect: If climate change heats up the Gulf Stream and contributes to warmer weather, and if it generates a greater number of hurricanes in the Gulf of Mexico, will butterflies stop flapping their wings in parts of New England? The answer is yes, and no. In 2012 Elizabeth Crone, Ph.D. and Associate Professor at Tufts University—along with Dr. Greg Breed and Dr. Sharon Stichter—co-authored “Climate-driven Changes in Northeastern US Butterfly Communities,” which was published in Nature Climate Change. Between 1992 and 2010, shifts in population numbers and geographic ranges have been observed in 100 of the 116 species of butterflies studied. Those species for which climate has demarked the southern extreme of their range are shifting northward, especially in the warmest regions. Those living at higher elevations are more stable, but species found in the lowlands are decreasing rapidly. Research shows that these responses are specifically related to climate. Frequent hurricanes and severe tropical storms associated with climate change are impacting Monarch butterflies, the only species that migrates long-distance to New England. Monarchs from eastern North America overwinter in the mountains of southern Mexico. Each spring they journey north, laying eggs on milkweed along the way. These eggs produce the next generation, which continues the migration north. Several generations are born before monarchs reach New England. Whether or not you ascribe to the Zuni belief that butterflies can predict the weather, they are harbingers of how our environment will evolve in an era of climate change. In Buddhism, butterfly metamorphosis symbolizes the human capacity for transformation—to transcend self-centeredness and be guided by a sense of oneness with all beings. The myriad decisions we make each day determine the fate of these ephemeral denizens of the air. Make energy-use and lifestyle choices that reduce carbon emissions and slow climate change. Create a butterfly garden of native plants for food and places to lay eggs, such as milkweed for monarchs. 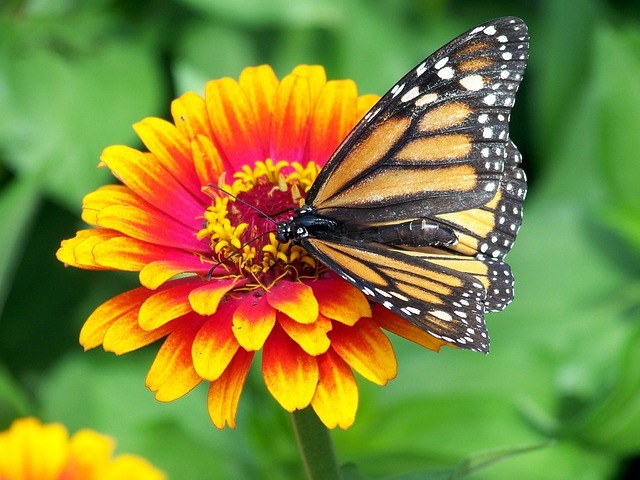 Don’t use pesticides, herbicides and other chemicals that harm butterflies, bees, and other beneficial insects. Get involved in land conservation to preserve critical areas and prevent butterfly habitat loss. Support conservation groups working toward these ends. Inform others about what is happening with butterfly populations and encourage them to track butterflies and work for positive change. DO JUST ONE THING: Pick one way you’re going to help Monarch butterflies. Our Vermont communities face a series of related ecological and economic challenges. These include: managing our wastes, reducing our dependence on fossil fuels, generating employment in sustainable industries and stabilizing our municipal tax rates. Although as a state, we are green leaders, we nevertheless have a lot to learn from countries, such as Finland, which have addressed these issues in ways that are both eco-friendly and profitable. Here’s an example. The Finnish company BioGTS has developed a dry anaerobic digester that converts diverse organic waste streams into bio-fuels and electricity. The waste streams it can process include sewage sludge, household (Act 148) wastes, institutional food waste, manure and other farm wastes. Outputs include bio-diesel, bio-gas and dry organic-grade fertilizer that can be sold to farmers and home gardeners. The wonderful thing about BioGTS technology is that it’s modular. Mills are custom made in Finland and built to scale, depending on the needs of a community. This enables BioGTS to create diverse solutions, from farm-scale units to large metropolitan ones. Their largest order to date is for a Chinese mill that will process 31,000 metric tons of agricultural biomass into bio-gas for the regional gas grid. BioGTS technology enables profitable biogas production – even with smaller amounts of waste. Their dry anaerobic process is odorless, requires no process water and is more efficient than wet anaerobic processes now in use locally. With better economic performance, the cost of buying a mill can be recovered more quickly. For this reason, BioGTS is today one of Finland’s fastest growing companies. Vermont municipalities should be able to afford these mills because they can be acquired via lease/purchase arrangements. In our region, a consortium of towns – perhaps Woodstock, Hartford and others – could purchase a district mill to the benefit of all. Revenues in excess of lease payments could go to stabilizing the local tax base, funding road repair or upgrading other public services. Once a mill is completely paid for, the revenue stream should make a significant impact on town budgets. In short, BioGTS technology could be a multiple win for us. Modules can be delivered via ocean freight and trucked to selected sites, where they can be quickly assembled into local mini-mills. All mills are automated and remotely monitored, which should simplify local operation. A district mill in our region could be managed by public employees or farmed out to a private company with the marketing skills to optimize revenue from the sale of bio-fuels and fertilizer. Such public-private partnerships are common practice in Finland and work well for all parties. For more info, visit biogts.com. In the interest of full disclosure, I have no personal economic interest in BioGTS, nor do members of my family. I discovered the company in the course of writing a book and simply wish to share my knowledge. 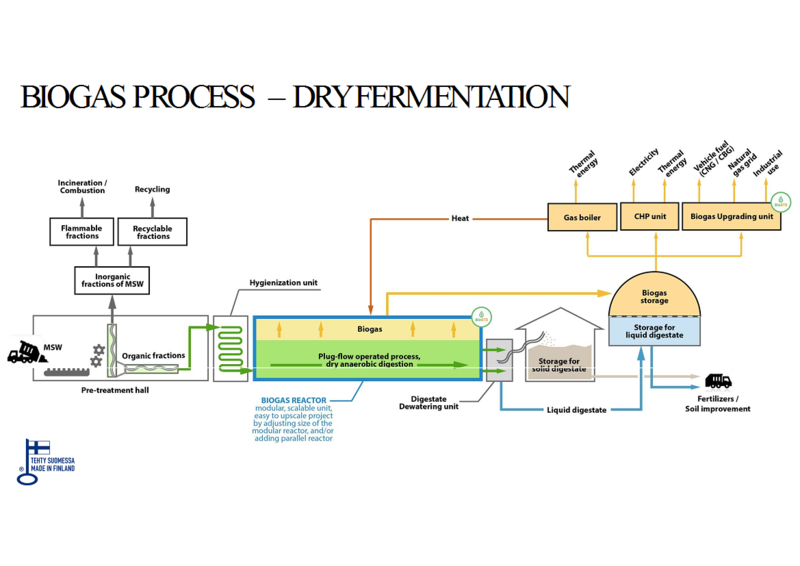 Should our community develop a strong interest in BioGTS solutions, the company has offered to do an open Skype session on the economics of a mill designed around the volumes of waste we can generate as feedstock. Jay is a semi-retired investment advisor and a board member of the Academy for Systems Change (www.academyforchange.org). Here is a BioGTS mill in Finland. The site is compact and clean. The U.S. recycles about 31 percent of its waste, compared to 66 percent in Germany and over 50 percent in other parts of Europe. These countries are making significant strides on both ends of the recycling movement: to reduce the amount of waste produced and to recycle existing waste through a complicated sorting program. Spend five minutes in parts of western Europe and you’ll realize that the five Rs— refuse, reduce, reuse, repurpose, recycle—are ingrained in the culture. 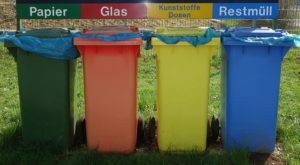 Every household has five different color-coded bins for different kinds of waste: paper, glass, packaging, compost, and trash. Every day a different bin is collected. If you mistakenly place an item in the wrong-colored bin, or mixed items together (like compost in the trash bin or a plastic bottle in the glass bin), the waste collectors will skip right over you. This is great incentive for getting it right. We rarely saw a stand-alone garbage can. Everywhere we went, from gas stations to mountain huts, they were accompanied by recycling and compost bins. In Germany they really get specific, providing separate recycling bins for each color of glass. All of the sorting makes sense; mixed recyclables are harder to sell. Countries that properly sort their recyclables have an easier time finding a buyer for their waste than countries, like the U.S., that throw everything into one bin, a practice known as single-stream recycling. But today, even conscientious sorters are having a difficult time selling their waste. For years Europe and the U.S. shipped much of our recyclables to China. The country’s recent ban on foreign trash has made one thing painfully clear: We’re all producing too much garbage. According to the EPA, Americans export about 22 million tons of material every year (a third of our total recycled material). Plastic bags and wrap are the worst culprits. The EPA reports that Americans use 380 billion plastic bags and wrap annually. We have to do something. In parts of Europe, plastic bags have been under siege, through the introduction of fees, for over a decade. During our travels we found that cashiers may begrudgingly hand you a biodegradable plastic bag if you show up unprepared. But most of them watched us struggle to hand-carry our items without an ounce of sympathy. There, environmental considerations take precedence over service and convenience. Recycling has never been the stand-alone answer to our environmental problem. Only 9 percent of all plastics produced globally gets recycled. Why? Because recycling is complicated and difficult, due to the wide range of additives and blends used in plastic products. Now that China has closed its doors to foreign garbage, we’re forced to confront the real issue: overuse of plastic. What can be done? Creating incentive for companies to decrease waste production is one tactic. Germany’s Green Dot system, which has been around since 1991, is an interesting model. The program has reduced the country’s garbage by about 1 million tons. Manufacturers and retailers pay for a “Green Dot” on products; the more packaging, the higher the fee. The European Commission plans to propose a tax on plastic bags and packaging, and is working to make all plastic packaging reusable or recyclable by 2030. They’re also considering a tax on virgin plastics so that companies are incentivized to use recycled plastics. The bottom line? Recycling simply isn’t enough. We have to start producing less and reusing what we already have. Sources: Statista.com, resource-recycling.com, nytimes.com, epa.gov. DO ONE THING: Say “no” to plastic bags and wrap. When you think of “extinction,” you probably don’t picture lettuce, corn, or cucumber being at risk. Believe it or not, many crop varieties today are in danger of going the way of the dodo. If you were a gardener in the early 20th century, you would have been able to flip through a seed catalog and choose from hundreds of varieties of each fruit and vegetable. Now very few of those can be found commercially. In 1903 we had almost 500 types of lettuce; by 1983 there were only 36. In the same eighty year period, available corn varieties dropped from 307 to only 12, and cucumber went from 285 to 16. It’s a similar story for countless other food crops across the world. What happened was we shifted from being seed savers to seed buyers. Over most of agricultural history seeds were the concern of small scale farmers and home gardeners, who would let some of their plants produce seed in the fall, save that seed over the winter, and plant it the following spring. Seeds were considered a public resource and traded freely among people. In the last century, however, we have become increasingly dependent on a small handful of corporations for acquiring seed. These companies focus on fruits and vegetables that will withstand transportation and look good in the grocery store; they are not concerned with preserving crops of the past. Due to the privatization of seeds, fewer old varieties are being grown and as a result our food system has been weakened. Without the genetic diversity there once was in seed, we are relying on a small number of crops to feed a lot of people. And as we all know, less biodiversity means greater potential for collapse. Here’s how you can help – try seed saving in your own garden! The best way to keep heirloom fruit and vegetables alive is for more people to grow them. First off, you’ll need some open-pollinated seeds as these will produce plants identical to the parent. Do not use hybrids; they are a cross between two parents and the next generation will not produce true. The easiest crops to start with are tomatoes, lettuce, peas, and beans because they are self-pollinating and therefore will not cross within the species. There are lots of helpful resources out there to get you going. 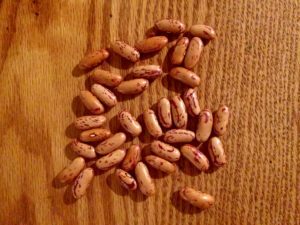 The Seeds Savers Exchange has a great website with instruction for beginners. And did you know we have a local seed company? It’s called Solstice Seeds in Hartland, VT and can provide you with an assortment of open-pollinated seeds, all with intriguing names and histories. One of the perks of saving seed is you only have to buy seeds once! Saving your own seed will allow you to separate yourself from the industrial agriculture model and take control of your food in a sustainable way. It will also enable your crops to adapt better to your specific garden site. Because you will be selecting seed from your best performing plants, the traits you find most appealing – like vigor, taste, or color – will be magnified. After years of seed saving, your crops will be adapted to your local growing conditions as well as your personal tastes. This is what growers before you have done for centuries. By saving and planting seed, you will be participating in an ancient tradition and doing your part to preserve history.